Bubba tried something new with his summer sausage. I didn’t think it could be improved; however, he added pork to the mix this time, plus more spices, so now it has been taken up a notch. Nothing is better than fresh homemade, and I especially like this recipe because we know exactly what is in the summer sausage! If you’ve been following my blog the last 5 years, you probably know that “Bubba” is really our older son, Bill, Jr., and that he has been making delicious summer sausage over the years, like this. The butcher at our local Italian butcher shop grinds the beef and pork together to blend the meats thoroughly. Use 75% ground beef. Summer sausage requires the fat, not only for flavor, but also to hold the log together. 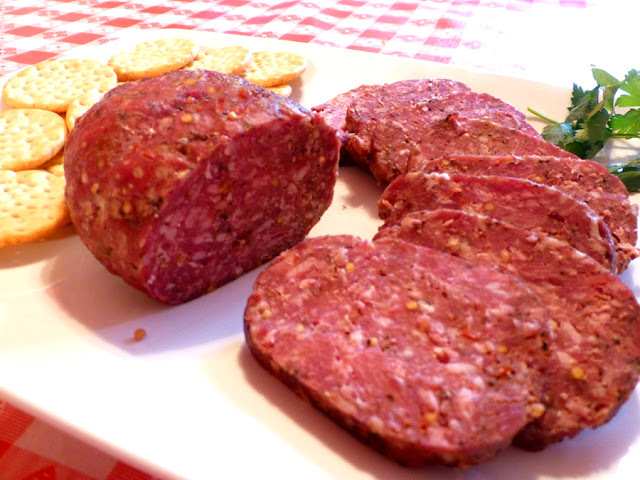 Using a leaner grade of beef will result in dry crumbly summer sausage. Do not substitute regular table salt for the Morton Tender Quick Cure; they’re not the same thing. It’s easy to make, but takes a little time; 5 days to cure, with kneading the meat once a day for a couple of minutes. Casing is not needed for the finished rolls. It’s well worth the wait, good and spicy! It’s incredibly delicious ~ I haven’t bought summer sausage once since Bubba started making it, it’s that good! In a large mixing bowl, combine meat well with remaining ingredients, making sure it is thoroughly mixed. Cover with foil, and refrigerate. Knead, recover and place back in refrigerator. Knead meat, and roll into 11 loaves. Bubba places the meat on a board and puts some pressure into it as he rolls, so that the meat packs together without air gaps. Place rolls on broiler pan and transfer to oven. Bake for 12 hours, turning every 2 hours. Remove from oven, place on wire rack and let cool to room temperature. When at room temperature, transfer meat, rack and all into refrigerator. Make sure to place a pan under the rack to catch drippings as it cools, and in the refrigerator also. Once it has cooled to fridge temperature, remove from rack and place individually in plastic bags. Either keep in refrigerator or freeze. Way to go, Bubba! It’s delicious!!! This is a delicious hearty side dish for these chilly days in early Spring ~ actually, it’s snowing like mad now with 3” on the ground, and a forecast of 6” total of the white stuff before it ends later today. 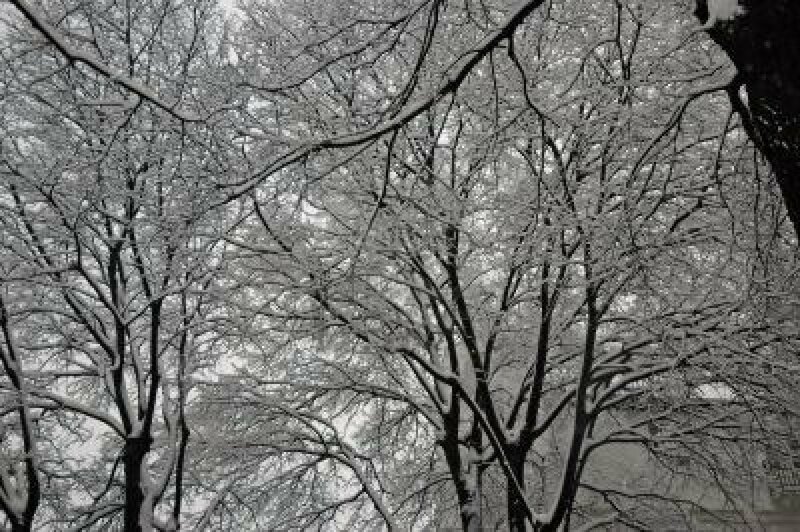 It wouldn’t be Spring in the Chicago area without a little snow in the forecast! Savory ingredients are here: chewy, charred cauliflower, fried capers and breadcrumbs, plus browned butter that’s fortified by whole grain mustard. Pappare, Italian, translates: to gobble up. 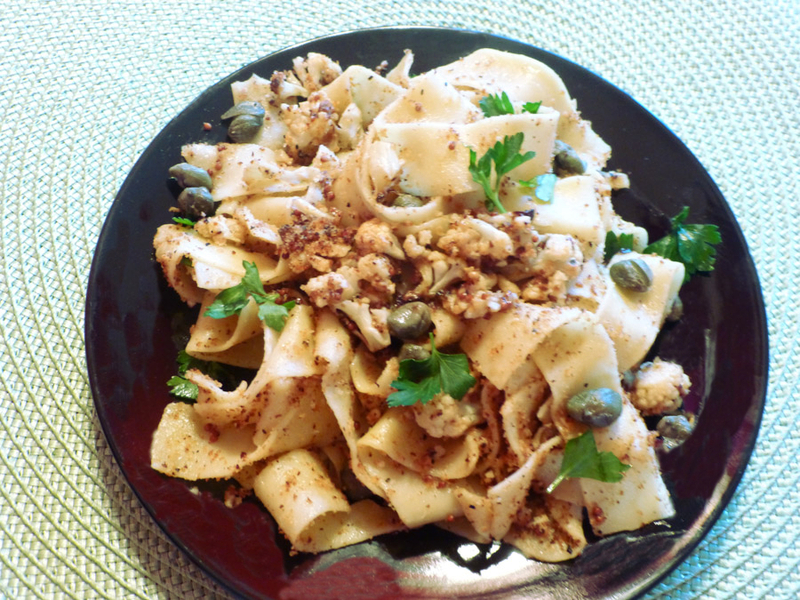 Pappardelle pasta is a broad, flat long ribbon noodle, a cross between tagliatelle and lasagna, in width. It’s perfect for dishes of this sort. “Gobble it up” straight away while it’s piping hot and full-flavored ~ I could easily make a meal of it! Toss cauliflower with 2 tablespoons oil, salt and pepper on a baking sheet. Broil until charred and tender, 8 to 10 minutes. Heat remaining 2 tablespoons oil in a high-sided skillet over medium-high heat. Sauté capers until crisp, 5-6 minutes; transfer to paper towels to drain. 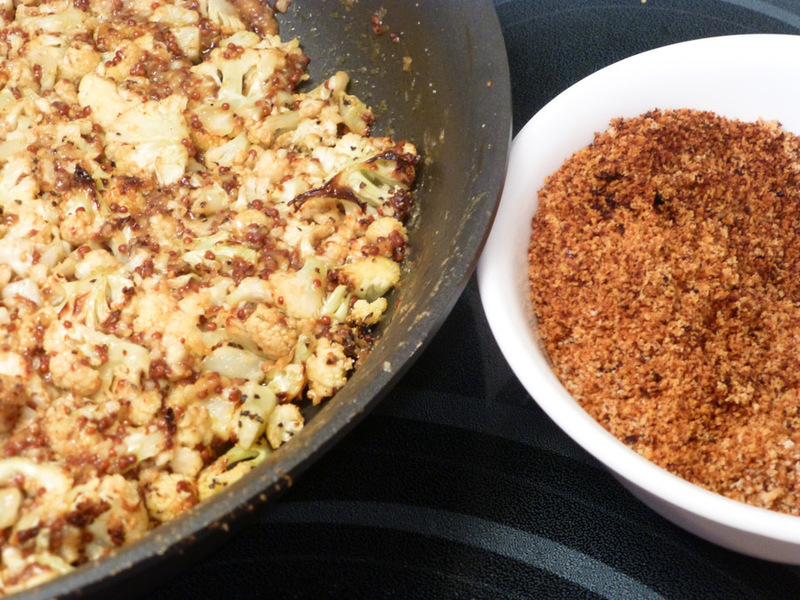 Cook bread crumbs and chile flakes until crisp, 3-4 minutes; transfer to plate. Wipe skillet clean and melt butter over medium heat, cook until butter is a deep golden brown, 6-8 minutes. Stir in mustard, garlic, salt and pepper. Add roasted cauliflower to skillet. Meanwhile, bring a large saucepan of salted water to a boil. Cook pasta until al dente, about 7 minutes; drain. Add pasta to skillet with half of the reserved bread crumbs, and half of the parsley; toss well. Garnish with capers, remaining bread crumbs, and parsley. This is a tasty Asian twist on salmon! The popular white miso in this recipe is slightly salty, a bit sweet ~ having a mild taste that blends well with pineapple juice for a delicious glaze. 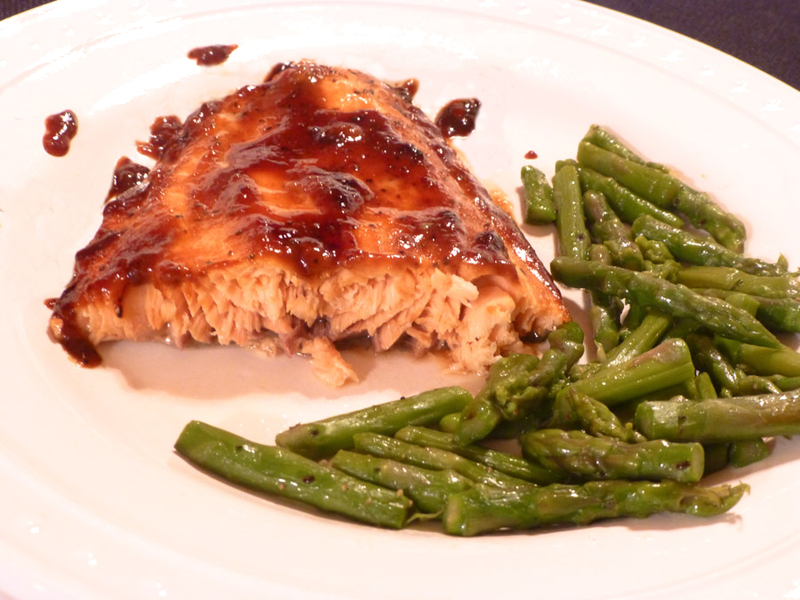 It provides an ideal accompaniment to salmon by giving depth and flavor to the dish. Plus, it’s a healthy addition, being packed with vitamins and protein. This recipe was featured in Country Living magazine. If you’re looking for a great new salmon recipe to try in your kitchen, this could be perfect for you! We each ate one salmon fillet for dinner; and the next day, ate one for lunch, atop mesclun greens. Doesn’t get much better than this! In a medium saucepan over high heat, cook the pineapple juice, soy and sherry for 20 minutes. Stir in brown sugar and cook for 5 more minutes. Using a whisk, stir in miso. Remove from heat, allow mixture to cool. Season salmon fillets with the pepper and place them in a shallow baking dish. Pour pineapple glaze over the fillets, turning to coat each side, and chill for 30 minutes. Place the salmon on the top shelf of the oven and cook until the flesh turns opaque, about 7 minutes. Change the oven temperature setting to broil. Cook salmon under broiler until the glaze begins to brown – 2 to 3 minutes. We all turn a little bit Irish on St. Paddy’s Day, and it’s fun and tasty when our food can follow suit! Apple cakes like this one are the traditional sweet in Ireland. In the old days, it would’ve been baked in a "bastible," a black iron kettle by an open fire. 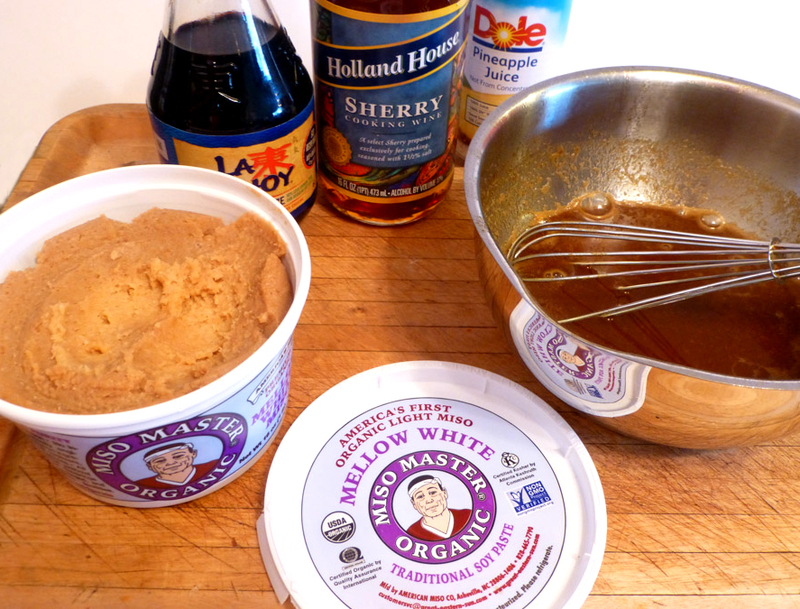 I happened upon this recipe, created by Margaret Johnson ~ who is perhaps the most prolific Irish-American writer of topics regarding Irish food and drink ~ and knew I had to try it. 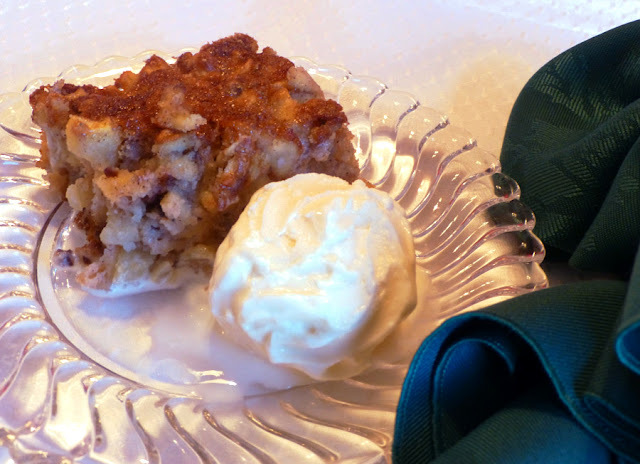 This version is slightly adapted, using more cinnamon and less sugar, and pecans swapped for walnuts, with Honeycrisp apples substituting for Granny Smith. Maybe you’d like this moist cake served straight from the oven, with a dollop of whipped cream, but I think it’s perfect for breakfast the next morning! In a large bow, cream butter and sugar until light and fluffy. 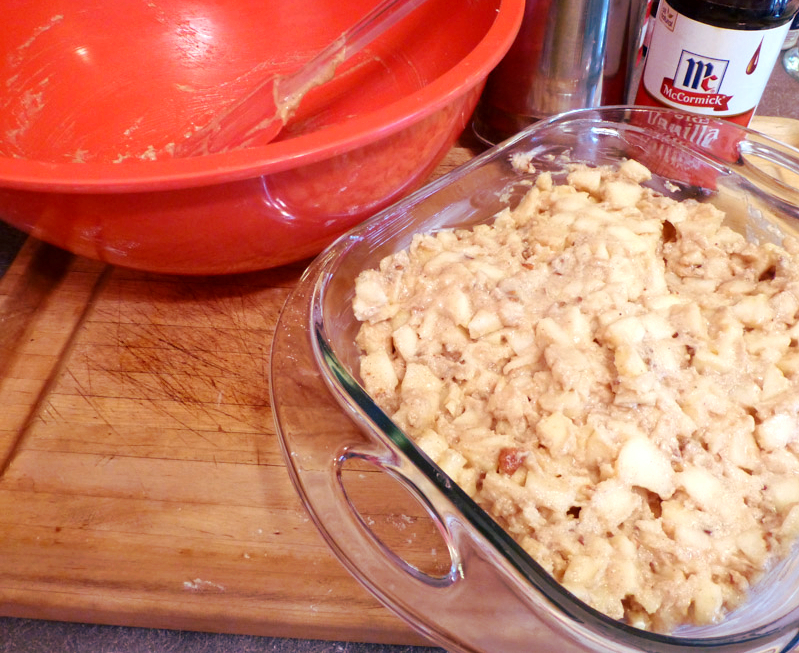 Add the egg, apples, nuts and vanilla, and stir well. Sift dry ingredients together and add to apple mixture, combing well. Pour batter into the prepared pan, spreading evenly. Bake until cake is lightly browned and a toothpick inserted into the center comes out clean, about 45-50 minutes. Let cake cool in the pan for 5 minutes, then unmold and serve hot or cold with vanilla ice cream or whipped cream. These were some of the best pork chops we’ve ever eaten! We wanted baked “breaded” pork chops for dinner; however, I was out of eggs to whip up and dip the chops into before cooking. But, I did have a container of Egg Beaters Southwestern Style in the refrigerator. The egg beaters include red and green peppers, onions and a variety of spices ~ a great combination that I will be using again for this type of meat dish. After the egg dip, the pork was dredged in a mixture of Penzeys Ozark Seasoning, panko bread crumbs, and a little garlic powder, salt and seasoned pepper. 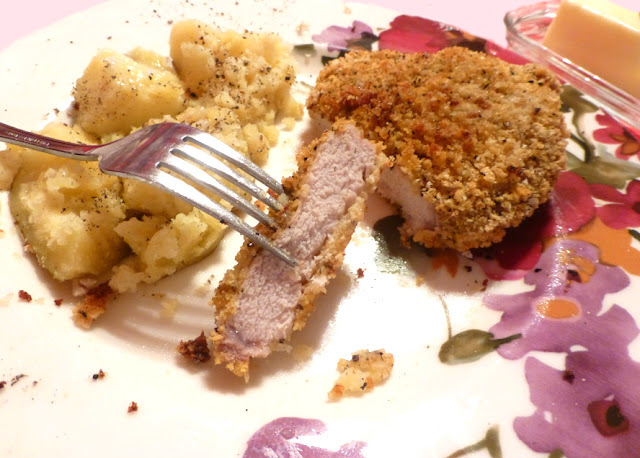 They slowly baked into some of the best pork chops ever! They were tender, moist and lip-smacking good! Delicious! Pour olive oil onto baking sheet, tilting to cover entire pan. Pour Egg Beaters in shallow bowl, and dip pork chops, coating both sides. Combine remaining ingredients on plate, and dredge pork shops. Bake uncovered for 1 hour, or until tender, flipping once after baking 30 minutes. I still regret the day I didn’t take time off from work to attend Julia Child’s cooking demo and book signing at the Chicago Botanic Garden years ago. I’m a huge fan of hers and, it would’ve been a wonderful thing ~ a great memory, for sure ~ and I know for a fact, nothing memorable happened at work that day! Chicken is so popular, and there’s a good reason why; it’s delicious, healthy and the price is right. Not much beats this roast chicken of Julia’s. It’s moist and meaty on the inside with a great golden roasted color on the outside. This is perfect roast chicken for about any occasion! You’ll have to make it to find out how delicious it is! Melt 1 tablespoon butter in skillet. Add diced carrots, onion and celery and cook over moderate heat until softened. Wash chicken rapidly inside and out with hot water and pat thoroughly dry. Pull neck skin up over the breast and salt and pepper the cavity. Spoon in cooked vegetables, a handful of celery leaves and the lemon slices. Massage chicken with 1 tablespoon butter. Tie ends of drumsticks together and tuck wings underneath body. 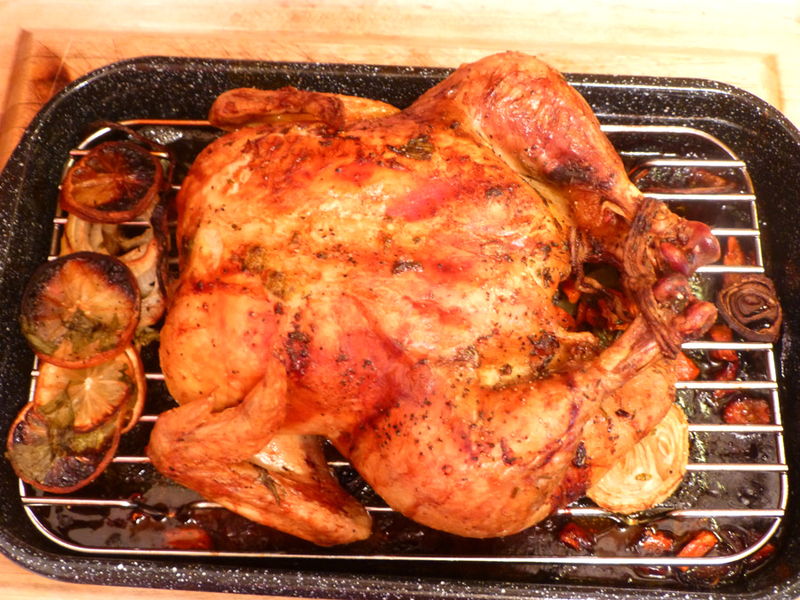 Use a roasting pan 1-inch larger than the chicken. At 15 minutes: Brush the chicken with the remaining ½ tablespoon of butter. Scatter the sliced onion and carrot all around. Reduce the oven temperature to 350 degrees. At 45 minutes: Brush the lemon juice over the chicken. If necessary, add ½ cup of water to the vegetables to prevent browning. At 50 minutes: Baste with the pan juices. 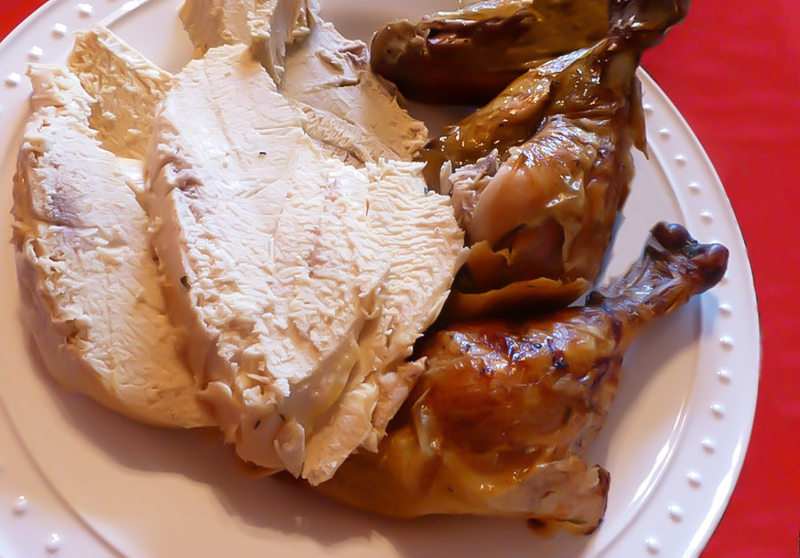 Test for doneness: The drumsticks should move easily in their sockets and flesh should be somewhat soft. An instant-read thermometer registers 165 degrees. Transfer to a carving board and let rest for 15 minutes. Carve and serve on a platter.